The sequel to Spy Kids; the second film revisits the adventures of the previous film. Carmen and Juni Cortez team up with two other spy kids, Gary and Gerti Giggles, and together they must save the world from the hands of an evil scientist named Romero (Buscemi). The Cortez siblings set out for a mysterious island, where they encounter a genetic scientist and a set of rival spy kids. I just saw a private screening of SK2 (okay, I was the only one in the matinee at this late date) and loved it. I find it easily comparable to the first - most people will love or hate both, unless you liked it once but don't want more of the same. As a kid, I'm sure this would have been among my favourite movies. As an adult, I'm surprised that I liked this at least as much as the latest Bond - in SK, the super-science is expected to be fantastical/over the top, while Bond's should have some basis in reality but doesn't anymore. Fun gadgets, realistic character interaction (siblings, in-laws/grandparents, first crush, co-workers), big-names in great supporting roles and cameos, and best of all, a skeletal swordsmen scene right from Jason & the Argonauts - I haven't been in heaven like that since the Mummy! The LotR references were great, too, along with lots of other good ideas mined from classics and more recent films. I don't mind when a movie steals elements from other films as long as it does them right, which this one does. Some people have complained about the gross-out humour, but there's not really that much, and it's totally in line with standard joke-fodder for kids that age, so if you can't accept that, you don't know kids. In fact, I thought the camel-stains showed better continuity than featured in most adult films, as it remained but was never mentioned. I'm sure kids will love it, and adults still in touch with their "inner kids" will, too. Be sure to stay right to the end of the credits for all the great extras! After reading some of these user reviews (especially the one about the Latino vs. White.... you have to be kidding me), I felt compelled to write one of my own. 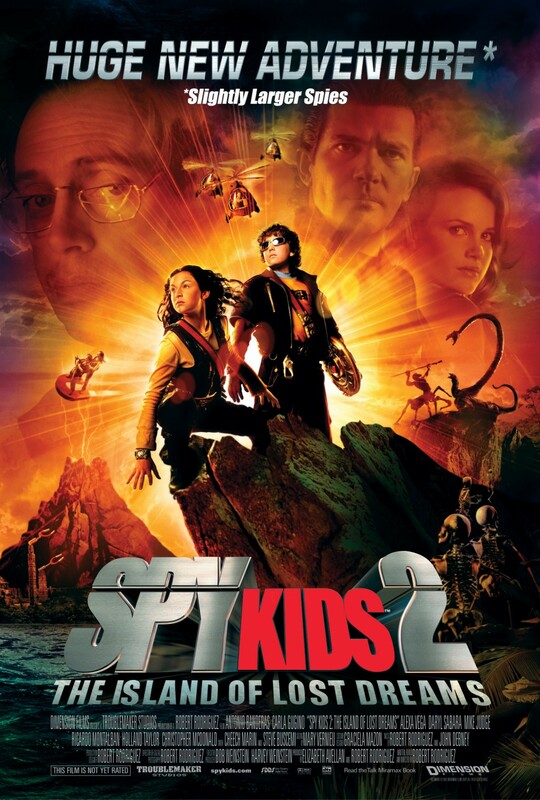 Spy Kids 2 had everything I expected - a whole new adventure with characters from first that is fun, exciting, humorous, and still manages to teach about doing the right thing. I also appreciated the references to the original ^_^ , and the special effects were even better than the first. The hardest people to please in this case would be my 2 daughters (4 & 7) who own the first Spy Kids on DVD and have seen it so many times they can act out the scenes down to the facial expressions and body motions. When they saw Spy Kids 2 this past weekend they were transfixed and left the theater excited about seeing Carmen and Juni in their latest adventure. A great movie for adults and kids... I cannot recommend this sequel highly enough! Though it's longer and more elaborate than it needs to be, it shares its predecessor's smart but relaxed sense of humor, a sophisticated imagination and the ability to be sharp and playful without being malicious.